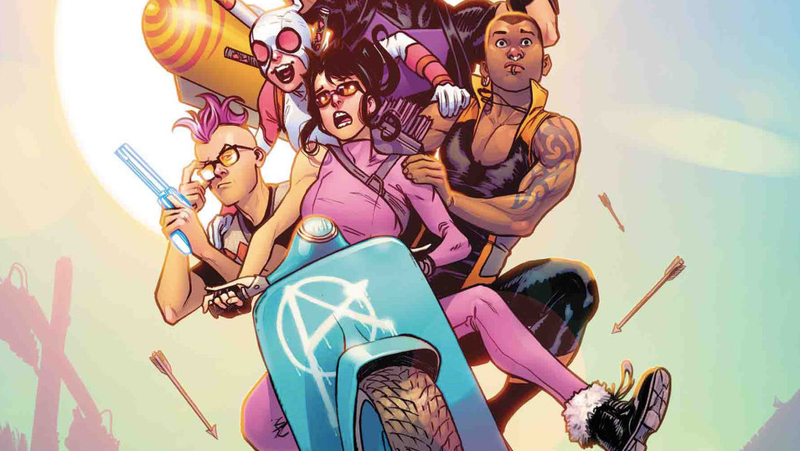 Over the past few months, some of Marvel’s coolest, most refreshing books like Gwenpool, America, Hawkeye, and Generation X have come to their unfortunate ends. As it turns out, though, the heroes of those series are moving on to something bigger: a new ongoing series. Clint Barton’s getting the gang back together in West Coast Avengers, a new comic series written by Kelly Thompson with art from Stefano Caselli. This time around, he’s recruiting some of Marvel’s best and brightest heroes... whose books all recently ended. America Chavez, Kate Bishop, Kate’s boyfriend Johnny, Quentin Quire, and Gwen Poole are all moving in together in Los Angeles to address the West Coast’s general lack of superheroes. “They all need and want something from being on that team together. Kate needs to help save LA, and she needs help to do that because villains have taken notice that there are no Super Heroes out there. Fittingly, Clint, who founded the West Coast Avengers, is stepping into more of a mentorship role and guiding the new generation of sun-drenched heroes from afar, but the circumstances of their adventures will be decidedly different. Rather than living in a swanky headquarters on Tony Stark’s dime, the West Coasters’ funding all comes from the reality TV show they’re participating in. There’ll finally be something else to watch in Marvel’s comic books besides whatever nonsense Mojo’s got going on when West Coast Avengers drops on August 22. The full cover for issue #1.